Steed of Dagorlad! 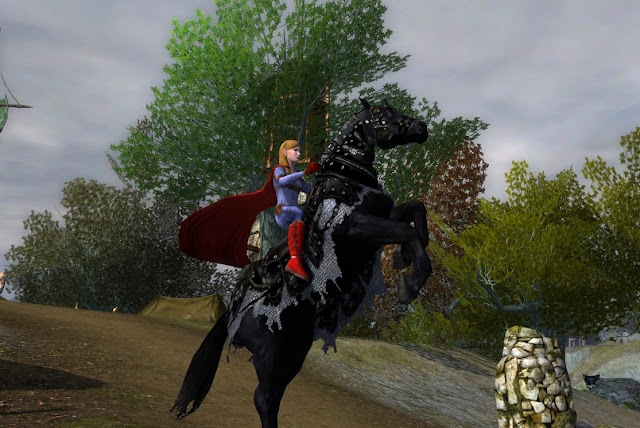 While I do not know if “steed of the month” is the new mode for lotro, it has certainly worked out that way so far this year (steed-of-nightwood, steed-of-khundolar, steed-of-warden). For April, we have the Steed of Dagorlad in the lotro store! 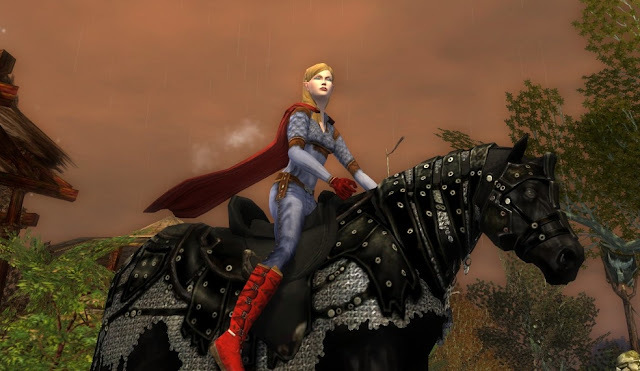 Many thanks to Goldenstar (CSTM: steed-of-dagorlad-available-through-april) for advising that one needs to look for the steed by name (type “Dagorlad” in the search) because at least as of last night, it was not in the mount area of the store where one would think he should be. And Yay! She posted a picture of me on this Warsteed for her article! Check out the link. As always, you can see all the steeds in lotro right here at danania.net on the Horse Corral page, All the Steeds. Let’s take a good look at Dagorlad! Steed of Dagorlad: Here is the basic Horse. He is a brown horse with black and chain link outfit and orange trim. Behind the saddle, he carries a sword and shield on one side and a pack of five daggers on the other side. We can see the dagger-side better in subsequent pictures. Warsteed of Dagorlad: This is a shot of the Warsteed wearing the default colors on the Dagorlas cosmetics. 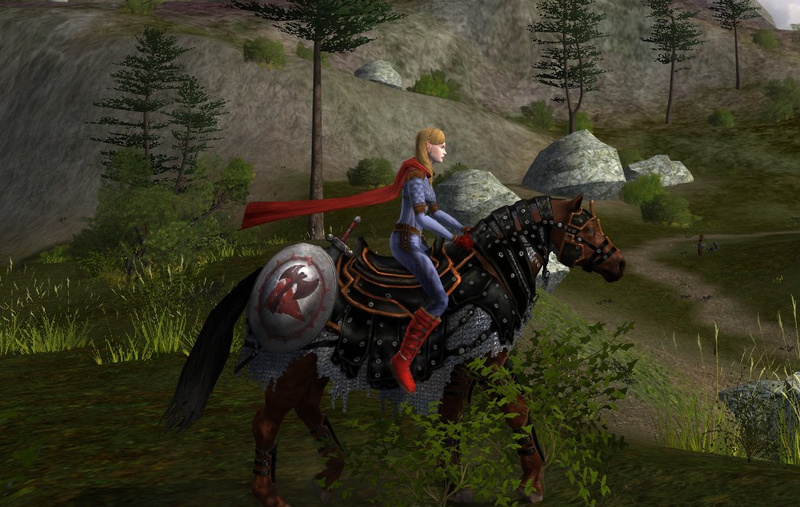 The Warsteed set comes with Leggings, Saddle, Caparison, Halter (head), and “Accessory”. The accessory, in the Gear slot, is the shield, sword, and daggers. Red Roan and default cosmetic colors: The sharp looking orange accents and armor inspired me to get a new hide color; I went with Red Roan. 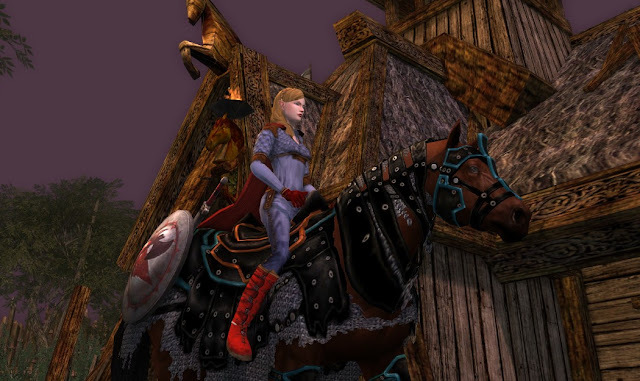 Red Roan with Sea Blue trim: The cosmetics do not dye much. Only the trim lines accept dye. I went with a Sea Blue on all the Dagorlad cosmetics to show off what dyes. That is a tough one that the saddle stays that orange trim. Do the other trim colors complement or clash with the undyeable orange? Black with Yellow trim and Dagger-side: The dark halter and caparison do mesh well with the dark horse also; actually I think I like all the color horses. This shot shows what yellow looks like on the cosmetics. It also shows off the Daggers that are the opposite side from the sword and shield. Black, no Gear, black trim: Ok, I think I found my winner. What I didn’t like above was the Orange trim. I’m sure it works awesome for some people, but I limit orange to citrus and summer clothes. The fix? Take the saddle and gear off, and no more orange. The Caparison looks sharp enough without the saddle. The gear still picks up some orange around the daggers so I dropped that as well. Now, the warsteed looks slick and lean! Update - By Request: Here is the Black warsteed, black trim, wearing the basic Default Black saddle. I noticed several nice saddles in the various options, but this one is totally free and looks great with the Dagorlad set. :) Thanks for the suggestion Elahedor! Have you tried it with the basic black saddle (the default Warsteed cosmetic)? The plain black saddle looks much better to me for this Warsteed. I edited the article to include a picture of your suggestion. veel dank je wel Lemina! Know that you will always be able to find pictures of the latest steeds here on danania.net. I am so grateful for your site and not just the pictures which help me a lot, but the blogs are extremely useful. 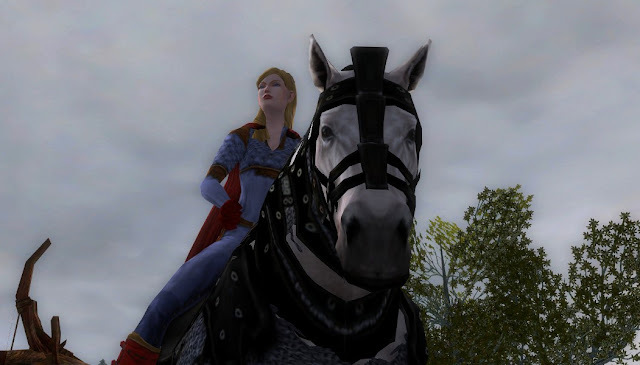 My RK is now 49, has her first LI, and is finishing Angmar following the epic story. Your posts give me that guide to set my bar by and pick some goals. Thanks so much. Yay Digger! That is wonderful! As always, feel free to ask any questions you may have. Thank you, Danania. One challenge I am having is understanding the interactions among the skills. It seems like do A first then B is stronger or 3A's then B then C causes awesome damage. It is a bit to remember with wargs breathing down your neck and your satchel being gnawed by worms. I just cannot find a simple explanation of those key interactions. Is this something you or others here might help clarify? I found this blog while trying to find some good pictures of the steed of the dagorlad. I see you have an amazing mount collection there! I bookmarked your blog, me love it! I have to ask, were you to choose between a class steed (Hunter's or champion's) or the dagorlad one which one would you go for? I don't have the luxury of going for two steeds and this week's sale makes the choice so hard. I am asking for your opinion in regard to the war steed appearance as well, since I am still a few levels away from getting a war steed. Between the 3 choices you gave, I would probably take the Champion Steed over the Hunter steed or Dagorlad. 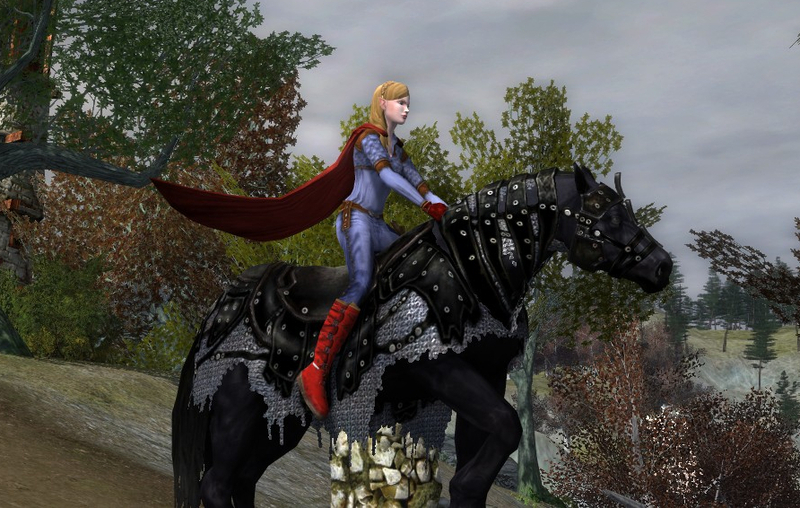 My reason: The Champion steed has a lot of nice plating, dyes well, and is not gaudy. Its pieces flexibly match a lot of other sets if you decided to mix and match. The Hunter steed has a distinct look, rugged, almost furry/wooly. 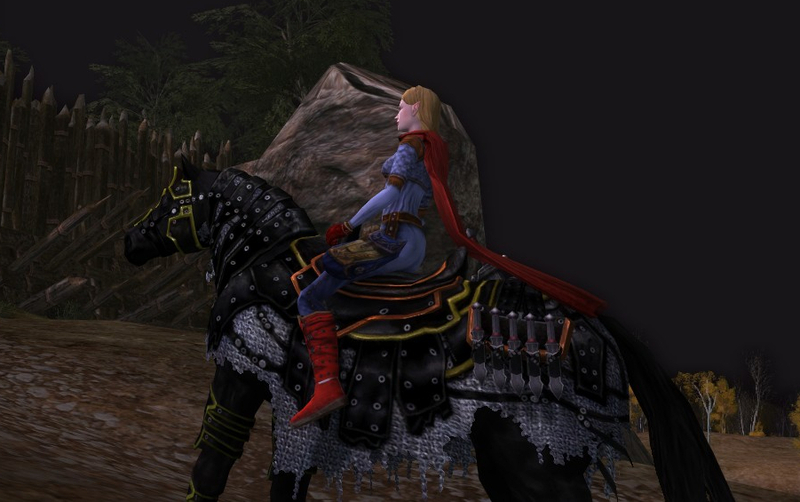 The Dagorlad looks gorgeous in black, but the orange trim, especially the undyeable saddle I preferred less. I will put it on the list to write a guide such as you describe. To get you started, I'll jot down an easy one and a more complex one for you to watch for and learn about. Shocking Words. The legacy on the Bag that will help it goes up to +20% shocking words chance. It has a +5% base, so your bag will get you to +25% chance to stun. Each increment to Battle Attunement will improve this skill by +7%, so at full attunement, you can see that your stun will almost always stick (bosses are typically immune to the stun). (1) All Frost and Lightning skills give +21% damage per the 4-deep trait bonus. (2) Winter-storm trait = after 5th frost skill use, next Lightning skill automatically critically hits (look down the chain, we are building to a Chilling Rhetoric-Essence of Storm chain). (3) Harsh Debate trait = Ceasless Argument gives 15% chance to get a +15% damage buff (for 20s). (4) Tale of the Storm trait = Any lightning skill gives 15% chance to get a +10% crit buff (for 10s). (5) Icy Discourse trait = Chilling Rhetoric (frost) gives +50% critical damage to Essence of Storm. (6) Essence of Storm (lightining) gives +100% damage in critical hits.